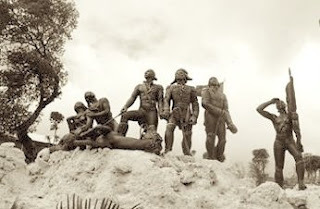 Monument commemorating the battle of Vertières, the last major battle of the Haitian Revolution. In this battle General Jean-Jacques Dessalines delivered the final bow against the the French troops commanded by Rochambeau. The French came to Saint-Domingue (Haiti) to re-establish slavery and brought the greatest armada ever launched out of Europe; supposedly against sub-humans. Napoleon sent his brother-in-law General Leclerc to Saint-Domingue with thirty-five thousand men and ninety-six ships in 1802. The decisive battle of the Haitian Revolution, the Battle of Vertières was on November 18, 1803–General Jean-Jacques Dessalines defeated Rochambeau's forces. The revolution which began in 1791, ended when Dessalines proclaimed the independence of Haiti and its new name on January 1, 1804. The French, lead by Generals Leclerc and Rochambeau were considered at the time the greatest army of Europe. Their war exploits are immortalized in the history books and their skills were praised as an art. They had conquered most of Europe, including Austria, Italy, Poland, Spain, Holland and Westphalia (now part of Germany). However, they were given a lesson in humility by an army comprised mostly of former slaves.